Occupying a central position in the static aircraft park, Calidus LLC is an industrial machinery and equipment company located in Abu Dhabi, which has branched into aircraft manufacture with two related designs – civil and military. Both are on view at the Airshow, the beefy-looking B-250 Bader turboprop an obvious source of interest, in being adorned with UAE Air Force markings. Whether or not that is significant, neither party will say, although it additionally carries a Brazilian civil registration, PR-ZNU. Surrounded by weapons which can be hung on its seven hardpoints, and additionally fitted with an electro-optical sensor turret under the forward fuselage, the B-250 is offered for close air support; intelligence, surveillance & reconnaissance; counter-insurgency; and advanced training. 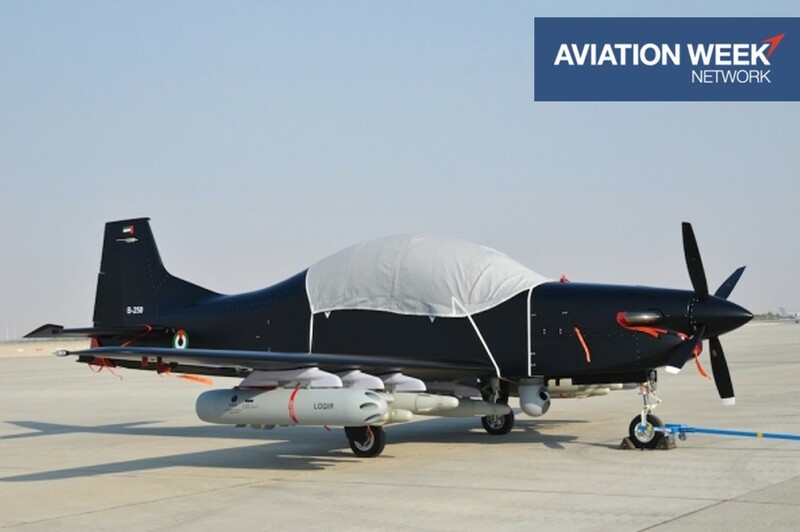 It looks like a slightly larger version of Embraer’s Tucano – which is not surprising, because both are from the drawing board of the Brazilian, Joseph Kovács. And it does the same jobs at a more economic price, says Calidus. The four-seat T-Xc, here in prototype form, hails from the same Brazilian stable, and though designed to replace aged Neiva T-25 Universals in South America, it has obvious applications as a utility and touring machine. Both aircraft were airlifted to the Airshow by a UAE Air Force Boeing C-17 Globemaster III, but Calidus is expected to announce plans for further production to be in the UAE. This, and more, will be revealed when the aircraft are formally unveiled today, adding a new chapter to an already interesting story. In 1983, in Brazil, Joseph Kovács put down on paper some ideas for a two-seat aerobatic touring aircraft, which would be like a baby version of the EMB-312 Tucano he had masterminded for Embraer (and is still in production as the EMB-314 Super Tucano, by the way). Design of the Kovacs K-51 Peregrino (Peregrine) began in earnest in 1988, but it was not until 28 November 1998 that the prototype flew. Though promising, the aircraft failed to find a sponsor willing to fund production and, even, a kitbuilt version did not see light of day. Undeterred, Kovács schemed a larger K-52, for which the K-51, by then with over 200 flying hours to its credit, was deemed the proof-of-concept. Meanwhile, also in Brazil, the Novaer company was formed in 1998 by the late Luiz Paulo Juanqueira, formerly head of Embraer’s equipment division, its main function being an aircraft component supplier. A subsidiary of the Geometra company, it became a prime contractor for the landing gear of the (Super) Tucano and also worked on design of Eviation Jets EV-20 (the reconfigured, former VisionAire Vantage) business jet. In October 2007, Novaer acquired the services of Kovács and rights to his designs, leading to 2009 proposals for a developed, side-by-side seat version of K-52 (Project T-Xc) as potential replacement for the Brazilian Air Force’s T-25 Universal and a U-Xc four-seater that was first known as the Pilgrim. In December 2014, the T-Xc became the Sovi (Ictinia Plumbea, the Plumbeous Kite) and the U-Xc was dropped. Also schemed was a Sovi MTP (military turboprop) with a bubble canopy. With the assistance of Brazilian government development funding, the new, four-seat Sovi first flew on August 22, 2014, partly thanks to the state holding company Santa Catarina, taking a minority stake in Novaer in 2013, with the intention of building a local factory, to open in 2018, on condition that funds were obtained for certification. The aircraft shown in Dubai is this original airplane, repainted although still carrying its Brazilian registration PP-ZKV and type designation N-210. In a parallel development, U.S. Aircraft Corporation was formed in Ohio in 2004 as a subsidiary of an aerospace abrasives company, having foreseen the need for nations friendly to the U.S. to have a new counter-insurgency aircraft. This prescience did not extend to its design for the aircraft it designated A-67 Dragon. The Missouri-based Golden Aviation company built a prototype which first (and last) flew on October 6, 2006, when the undercarriage partly collapsed on landing. A completely new A-67 Dragon was produced by dint of re-designating the K-52 in its tandem seat form, but the initiative terminated through lack of support…..until now.